In my eyes, there's no prettier sight than ground pistachios on chocolate ganache. When I'm at the store I always search for the greenest pistachios peeking out of their shells. 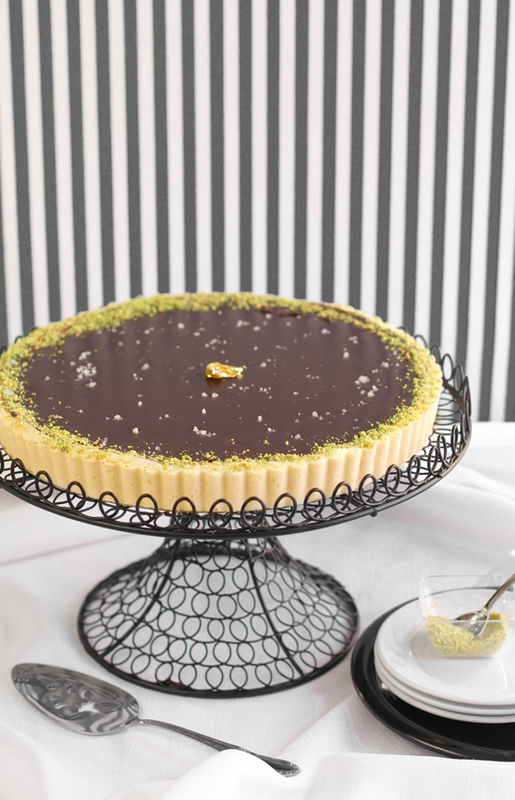 A sprinkling around the edge of this tart makes it a little more beautiful, but it's totally optional. 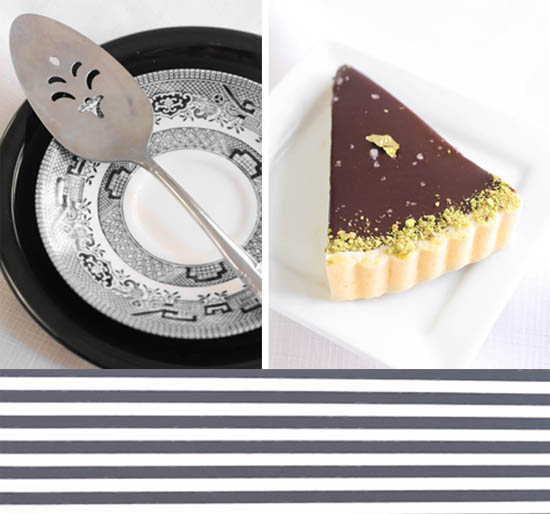 I also use and recommend Grey Celtic Sea Salt for this tart. It's the perfect coarseness for a topping and lovely light grey. Most of this tart recipe has been adapted from The Perfect Finish: Special Desserts for Every Occasion , but I've used my own caramel recipe. You'll need to plan ahead so the tart dough can chill, but most of the components are very easy to make. If you don't own a tart pan, a metal 9-inch pie pan will work fine. 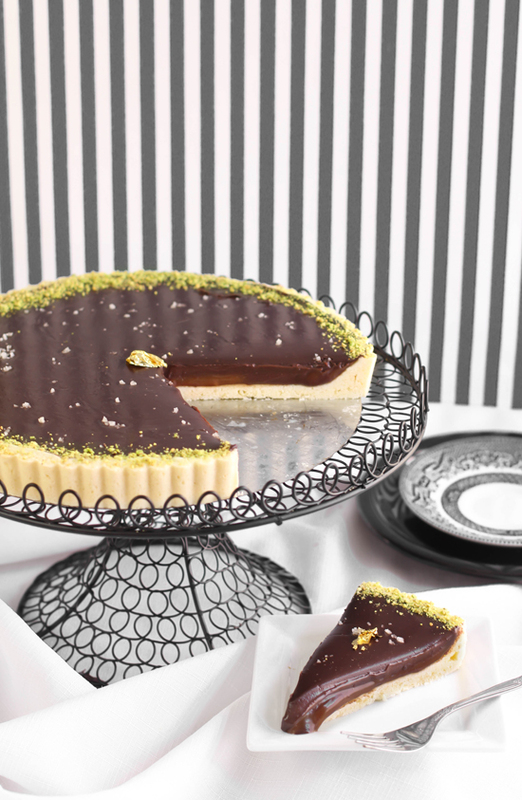 This recipe is also known as the "Twix Tart". Cream butter and sugar together in the bowl of a stand mixer fitted with the paddle attachment. Add eggs; mix until incorporated and scrape down the bowl. Add 2 cups flour and salt and mix on low just until incorporated. If dough is very sticky, add remaining flour. Remove dough from bowl and wrap in plastic wrap. Refrigerate 1 hour. Roll out dough on a lightly floured work surface. Lay into a 9″ tart pan and trim excess dough with a knife. Place in freezer until very firm. Preheat oven to 350 degrees. Fit a large piece of aluminum foil into the tart pan so that it completely covers the edges. Place pie weights, dry beans or uncooked rice in the foil covered crust and bake for 30 minutes. Remove the foil with weights. The tart shell should be blonde. Shell may be baked for an additional 5-10 minutes for golden color (I did not do this). Let crust cool completely before filling. Melt the sugar over medium-high heat in a large pot. Whisk the sugar as it melts, and cook until it becomes a deep amber color. Remove from heat, stir in salt and let cool slightly. Pour the caramel into the tart shell. Tilt to cover the bottom evenly. Let cool in the refrigerator until caramel is firm. Very gently pour the ganache over the caramel layer. The caramel may want to move around a little, so pour a little at a time (using a ¼ cup measure to pour from will help). Place in refrigerator until firm. Toppings: Sprinkle with coarse sea salt before serving. 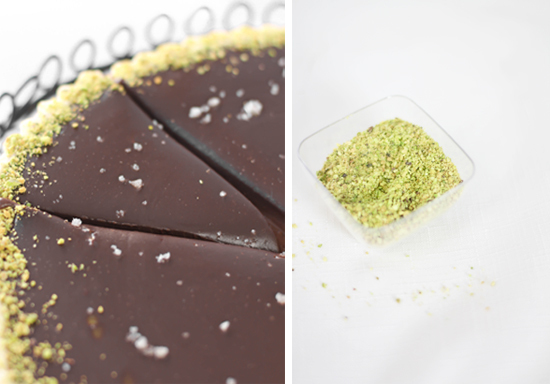 I also added ground pistachios around the tart's edge and a small piece of gold leaf in the center. I have a family member who is gluten intolerant and also cannot consume anything containing casein. Here is the tart I made for her. I taste-tested a little piece, and it's very close to the original. The only difference is the caramel - it is slightly less rich. Some (not all) components of this recipe are vegan, as they do not contain casein. Pulse flour and salt together in a food processor. Add coconut oil and egg. Pulse until the mixture clumps and forms a ball on one side of the bowl. Press into a 9-inch tart pan. Cover with foil and add pie weights, dry beans or uncooked rice to weight the pie during baking. Bake for 20 minutes covered then bake an additional 5-7 minutes uncovered. Remove and let pie crust cool completely. You’ll need a can of full-fat coconut milk that has been refrigerated for 4 hours or more. Do not shake the can before opening. Pour in the coconut cream and whisk until the mixture becomes a smooth sauce. Note: If lumps form, keep stirring over gentle heat until they have melted. In a small saucepan heat coconut cream and oil over medium-high heat very hot but not boiling. Pour the hot cream over the chocolate and gently whisk until the chocolate is melted and the mixture is smooth. Allow to cool slightly before using. Amazing!! I wonder if it's too late to get this on my table tomorrow!! A fabulous tart! So luscious and delightfully sinful. Amazing blog!! Beautiful photographs!! Deligious tart!! This tart is so lovely. The pistachios around the outside make it so pretty too. Great idea! I think the crust looks perfectly in contrast with the filling. I also like a sturdy crust in applications were the gooey-ness needs a friend to lean on. Cracks me up when people share their criticisms "Anonymously." OMG - this looks AH-MAY-ZING!!! I've been wanting to do some sort of caramel chocolate dessert, but have been hesitant to take a stab at it. This tart may be just what I needed! one question for you, I tend to bake for friends living on another coast, so is this shipable? THX. ooh i hope this makes an appearance in your book! it is on its way to me - my xmas pressie to myself! Amazing! As always! Swoon - I love it! Well theres everything I love right there on that plate...good lord in heaven, what I would do for a piece of that! yummyy!! Looking forward to make this soon! 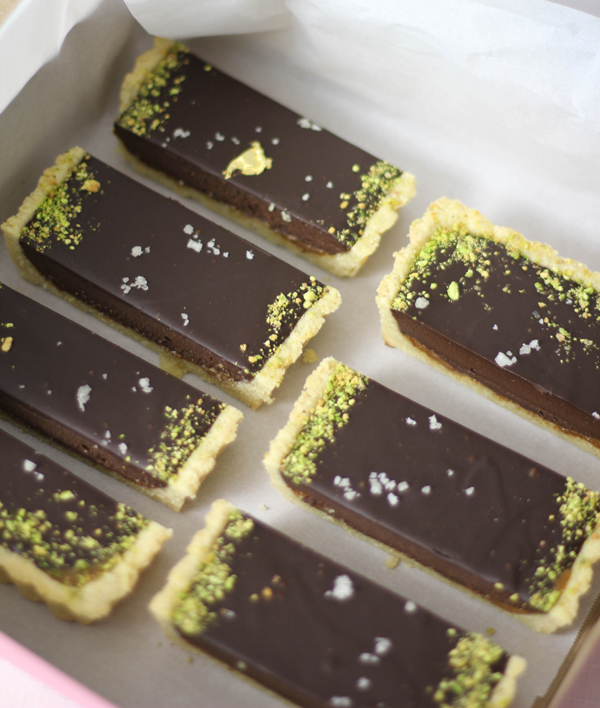 The green in the seasalt combined with the chocolate make this look SO tasty! This looks too good to be true. Great photos and I agree about the green of the nuts on chocolate. Just one suggestion: Why you don't post the procedure to making the cakes with pictures...sometime helps a lot how you do this delicious recipes!! I am just a little worried about the coconut oil, can we substitute it with something else. heather, thank you so much for including a gf version! can't wait to try this over the holidays. Oh my goodness so exciting to see a salted caramal casein free goody! We don't do thanks giving (i'm from the UK) but this will definitely be at boxing day this year!! I'm drooling just looking at the pics. They look stunning! At what point do you add the salt to the caramel? I can't find it in the recipe. Thanks for the heads up! Add it right after you remove it from the heat. Amazing looking dessert, I adore the way the caramel and chocolate parts are oozing off the tart, so decadent! I've just received your book, and I love it! This looks so delish! I can't wait to make it! I love the pistachio decorative touch!!! This looks awesome! I'm not a big chocolate fan, but pretty much everyone else in my family is. I'm thinking I'm going to have to make this. Your caramel looks delicious, too! Loved these from the moment I saw them! I just attempted the gluten-free version, and is it possible the recipe for the crust has mixed up numbers? There was far too much almond meal. I ended up using 1/4 cup oil and 3 eggs and it still was not a ball, but mostly dry crumbs. I would suggest starting with 1 cup of flour, and adding more if necessary. Dear Heather, I have a very pragmatical question: what do you do with all of your deserts :-)?? Do you eat them or sell them? Have you ever written a post about how to make a career of blogging. I have read that you recently left your day job to do this full time and I have nothing but appreciation for that. It is amazing how in today's age it takes but a single post on the world wide web to get noticed and. Congratulations! Hi Anonymous that had trouble with the tart crust! Above I link Elena's crust recipe, and made it just as she did,except for the method of cooking. 1/4 cup of oil and 3 eggs sounds like quite a lot for this recipe. It's hard to say what went wrong. I pulsed the mixture at 3 second increments until the dough all collected to one side of the food processor. It took a couple of minutes for it all to come together. So sorry you had trouble! Hi Anonymous that asked about the desserts! Gosh, I have to say that most of my family and neighbors are well fed. Sometimes my freezer is overflowing with desserts that we just couldn't consume in a timely manner. It can be difficult to find homes for all those desserts. Right now I'm looking into donating some of my efforts to retirement homes. I've never written a post about career blogging, and maybe that will happen after I've been doing it full-time for a little while. It's only after 3 years of blogging that I felt confident enough to leave my day job. What a big scary step that was! I'm only about 3 weeks into blogging full time so I'm slowing figuring out what kind of blogging schedule works now. Thank you for the kind words! The pies look absolutely lovely. The only thing is, I am sad to say but the gluten free version can't be called vegan, because of the egg in the tart crust. Right Emma, some components (as noted) are vegan, but it is not entirely vegan. this looks wonderful - just 1 question = did you use a flan tin that had a removable base or not? just worried about getting it out at the end :) from a NZealander! Gorgeous! Plus, I have a huge crush on that cake stand! I've never seen anything like it. That tart is amazing. I seriously wish I had that in front of right now. Looks and sounds so delish. WOW! 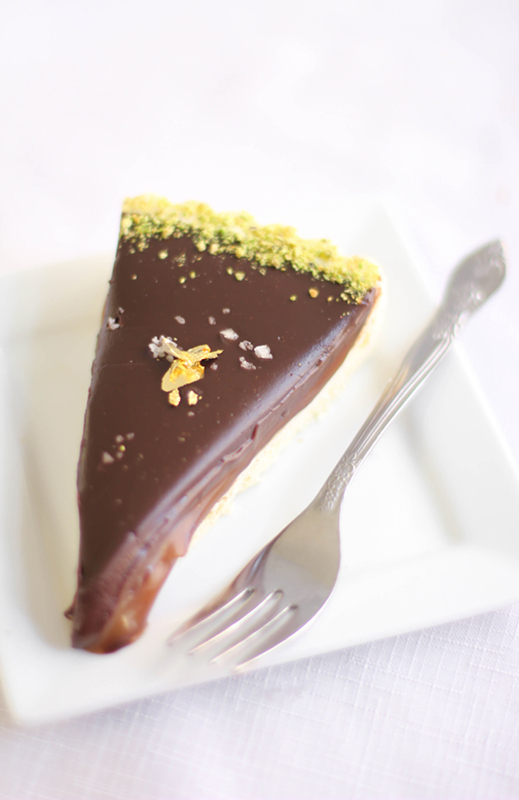 the gluten-free Sea Salted Chocolate Caramel Tart is amazing. I am thinking of making this for christmas - will it keep well in the fridge overnight if I make it on Christmas Eve? Yes, it definitely keeps well refrigerated overnight. How long can this tart be made in advance? Is it freezable? Or am I jus better off keeping it in the fridge? Thank you for the most awesome recipe. It took me 5 tries to make caramel, but now I have a very pretty dessert for tomorrow. Every recipe I've tried here are always winners! I made this tonight and it turned out beautifully! I can't wait to see how it tastes when I bring it to my book club tomorrow. The only downside, I thought, was that it took quite a long time to make. It would have been great to see baking time on the recipe. Thanks! Definitely one of my faves, to look at at least, sine I'm choosing one for the giveaway... I'll try making it when I get home from Morocco this summer! What would happen to the chocolate layer once the tart is taken out of the fridge where it set? Won't the chocolate start sweating at room temperature? The chocolate ganache didn't sweat when taken from the refrigerator. But it does soften at room temperature. This recipe (and the accompanying photo) look so amazing I had it saved for a few months before I was able to make it. I'm making it now for Christmas. The only sad thing is that my pie crust shrank, despite using the foil and rice as pie weights and freezing the dough in the pan for over an hour. I did have quite a bit excess dough so I'm wondering if I rolled it too thin? Otherwise, do you know what might cause the shrinkage? I'm hoping I'll be able to fit the ganache on top! Is there a certain temp for the sugar mixture before you add the cream in the caramel recipe?